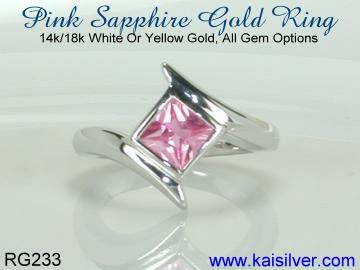 Custom Made Rings From Kaisilver, High End Made To Order Rings In Gold Or Silver. Kaisilver custom made rings get the same care and attention to detail irrespective of the metal that you select. Our skilled craftsmen do a terrific job for a range of ring styles and concepts, we can fulfill requirements for both modern and antique classical styles. You can choose the gemstone of your choice and the design can be yours or ours. Since each ring is fully made to order, all design modifications and ring size requirements can be accommodated. Most of the jewelry on our website is priced for 14k and 18k gold and also for 925 sterling silver. 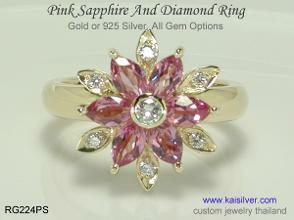 Custom made gold rings can be ordered in all three gold colors namely white, pink and yellow. You can discuss with our support team at sales@kaisilver.com if you have a requirement for 10k gold. Much of the work in crafting our custom made rings in gold or 925 silver is done by hand, skilled artisans and craftsmen with decades of experience give keen attention to every single detail. To ensure that your ring has more than just good looks, we research each design to build in features related to durability. In most cases, the metal weight invested into our custom made rings is at least 40-50% more than what other jewelers would provide. While we do understand that the long term durability of a jewel does not depend on metal weight alone, the fact is that a good metal weight lays the foundation for a sturdy jewel. 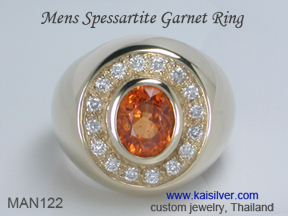 An impressive natural untreated spessartite garnet set in an immaculately crafted gold or 925 silver ring. The center oval spessartine gem is surrounded by glittering diamonds or white sapphires as per your choice ... more. 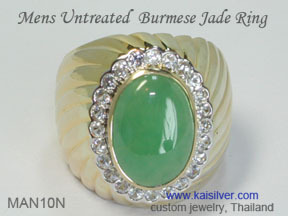 A custom made ring with natural untreated Burmese green jade, the oval jade gemstone in the center is bordered with a row of white sapphire gemstones. Made to order jade ring in gold and silver, all rings sizes ... more. A pretty pink sapphire gemstone and diamond ring, this custom ring can be ordered with different colored gems or different, sapphire colors set in the same ring. Wear it for any informal or formal occasion ... more. A gorgeous square sapphire gemstone ring, a 6mm pink sapphire handpicked and firmly set in an expertly crafted gold or 925 sterling silver ring. You can choose a white, pink, blue, yellow, orange or green sapphire ... more. 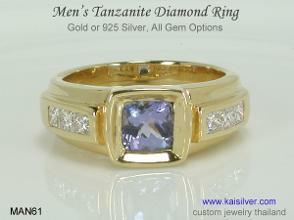 A sturdy men's tanzanite ring, this ring can be ordered in gold or 925 silver. Combining style and durability, the MAN61 gemstone ring can be ordered with the gem of your choice. The side diamonds can be replaced with gems selected by you ... more. The exotic appeal of tanzanite makes the gem a favorite for gold and silver rings worn by ladies and men. 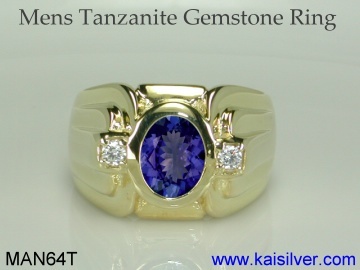 Shown here is a sturdy and impressive tanzanite gemstone ring. You can order this ring or any other ring on our website, with the gem of your choice ... more. Custom men's rings in gold or 925 silver, your choice of design and gemstone. 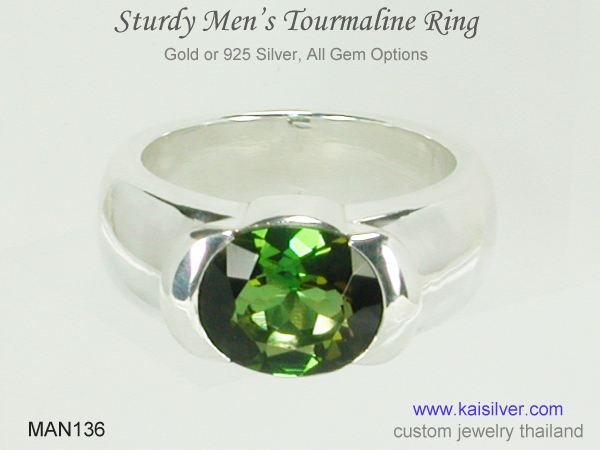 Shown here is a sturdy ring for men with a large gemstone ring. A rare 11x9mm oval green tourmaline gem is handpicked and custom cut for this tremendous made to order ring ... more. Custom men's jade ring crafted in gold or 925 sterling silver. 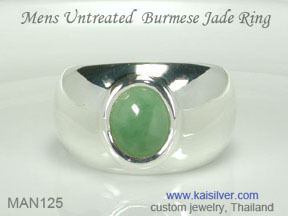 The gem in this made to order ring for men is a natural untreated jade gem from Burma. Moderately priced option for a Burmese green jade ring for men ... more. 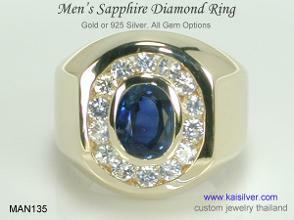 Kaisilver custom men's rings with sapphire can be crafted with your own design or with design concepts, show on our websites. Keep in mind that sapphire is found in a range of gorgeous colors and not just blue ... more. A gorgeous sterling silver or gold diamond and gemstone ring, interesting options allow this jewel to be personalized to suit your requirements. 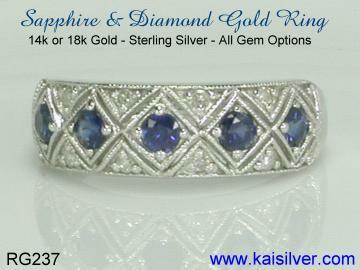 All sapphire color options or with gemstones of your choice ... more. A custom made tanzanite ring is your best option to ensure that, you get a gold or 925 silver tanzanite ring that you truly wish to have. 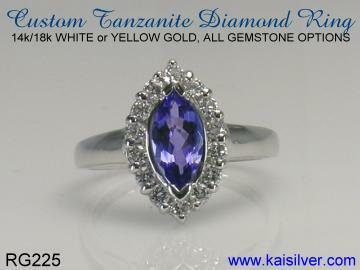 Our made to order tanzanite gem rings can be ordered with your design or ours ... more. A gemstone that is 1,000 times rarer than diamond set in an ancient ring, the 4 century old claddagh ring is considered to be the most meaningful jewel in history. 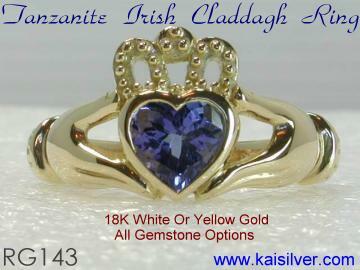 Kaisilver cladagh rings can be ordered in gold or silver with a gemstone of your choice ... more. A custom made tourmaline gemstone ring, crafted in 14k, 18k gold or 925 sterling silver this ring is available with the gem of your choice. 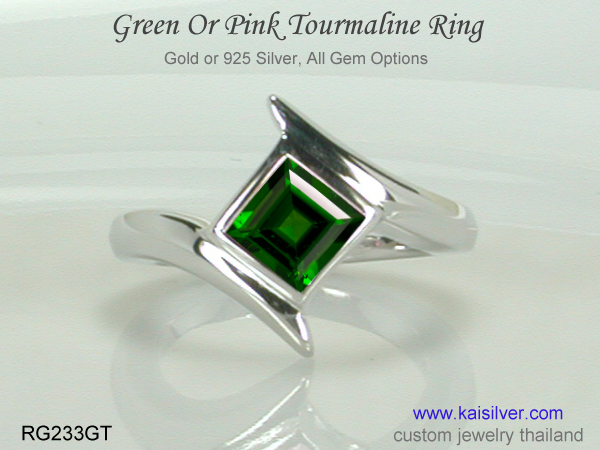 If you choose a made to order tourmaline ring, you can select a green or pink tourmaline for your ring ... more. 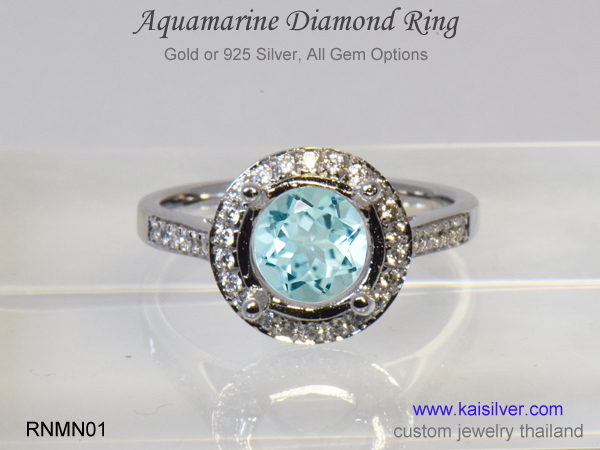 A gorgeous aquamarine and diamond ring, available in gold or sterling silver. The ring has good craftsmanship and optimized metal weight. This ensures that the ring will retain its shape for a very long time. You can order this ring with the gem of your choice ... more.